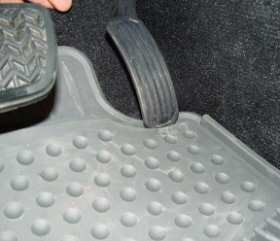 Example of accelerator pedal interference caused by out-of-position all weather floor mat. The National Highway Traffic Safety Administration on September 29, 2009 alerted Lexus and Toyota owners about conditions that could cause the accelerator to get stuck open under certain conditions. The agency strongly recommends taking out removable floor mats on the drivers side in certain models and not to replace them with any other floor mat, either from Toyota or any other brand. "This is an urgent matter," said U.S. Transportation Secretary Ray LaHood. "For everyone's sake, we strongly urge owners of these vehicles to remove mats or other obstacles that could lead to unintended acceleration." NHTSA notes that there continue to be reports of accelerator pedal clearance issues which provide the potential for an accelerator pedal to get stuck in the full open position. A stuck accelerator may result in very high vehicle speeds and a crash, which could cause serious injury or death. NHTSA said that Toyota has announced that it will soon launch a safety recall of various model year vehicles to redress the problem. However the safety agency warned owners to remove all driver-side floor mats from the models listed below immediately as an interim safety measure in advance of the recall. In September 2007, Toyota recalled an accessory all-weather floor mat sold for use in some 2007 and 2008 model year Lexus ES 350 and Toyota Camry vehicles because of similar problems. The advisory was precipitated by continued reports of vehicles accelerating rapidly after release of the accelerator pedal. The incidents appear to be related to factors including the use of a variety of unsecured floor mats, the particular configuration of the accelerator pedals in these vehicles, and the unique steps needed to shut off the engines in some of these vehicles with keyless ignition. For more information, consumers can contact the National Highway Traffic Safety Administrations Hotline at 888-327-4236 or the Toyota Experience Center at 1-800-331-4331 or the Lexus Customer Assistance Center at 1-800-255-3987. Information from Toyota is also posted at http://www.toyota.com and http://www.lexus.com.